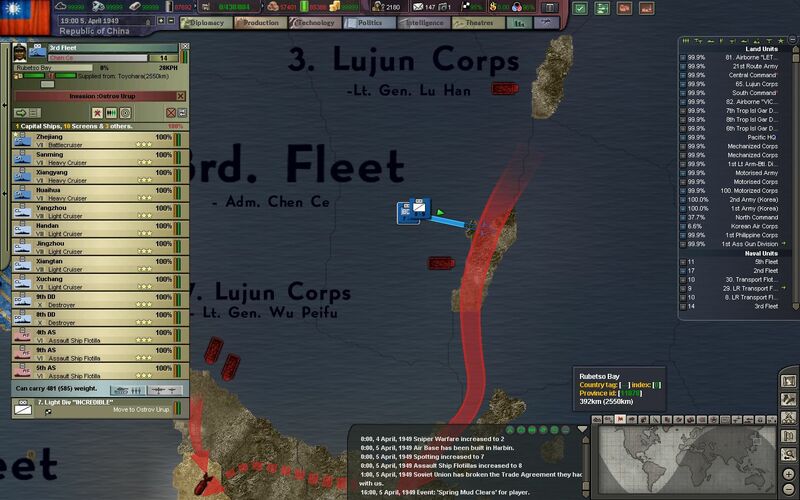 Hey all, and thanks for reading Episode 19 of my Republic of China AAR in BlackICE 8.6. If you missed the previous episodes, they are linked below. 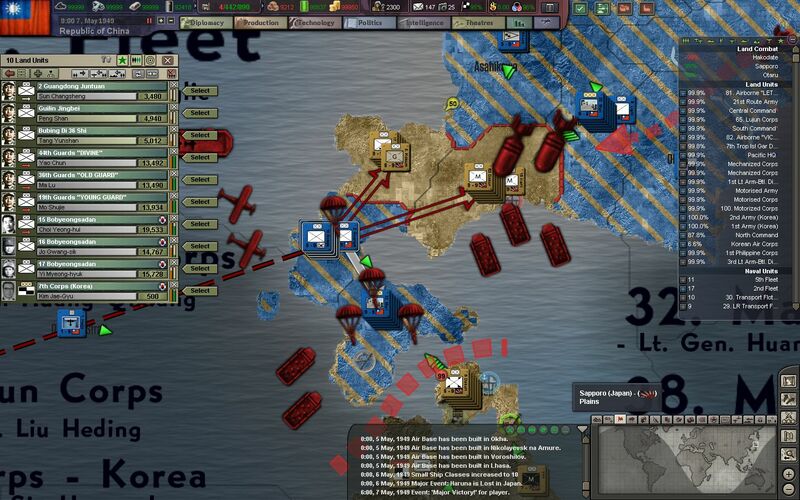 After months of planning and deliberation, the opening stages of Operation Warhammer - our long anticipated invasion of the Japanese home islands has been finalized. 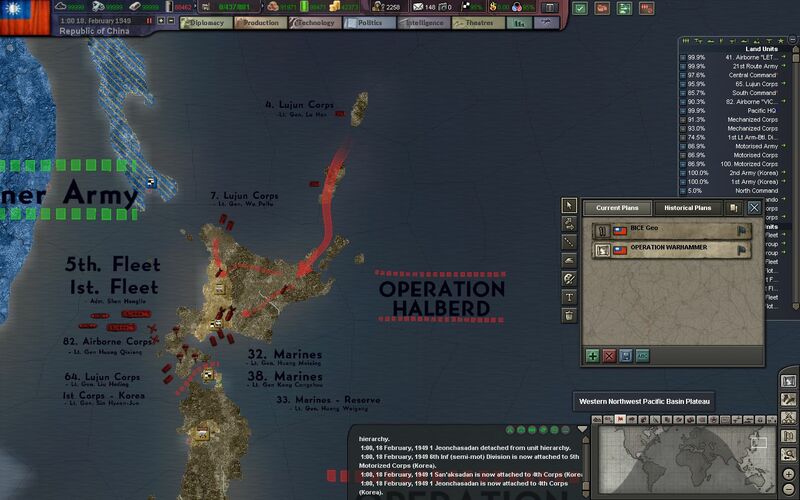 Operation Halberd will first seize the northern island of Hokkaido, through a series of coordinated landings around the island. 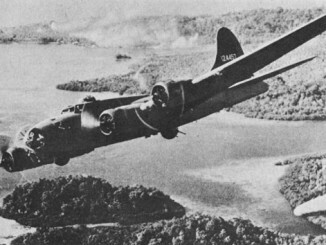 Many generals favored attacking the southern islands of Kyushu and Shikoku first, but intelligence deemed that air and land forces were too heavily concentrated there. 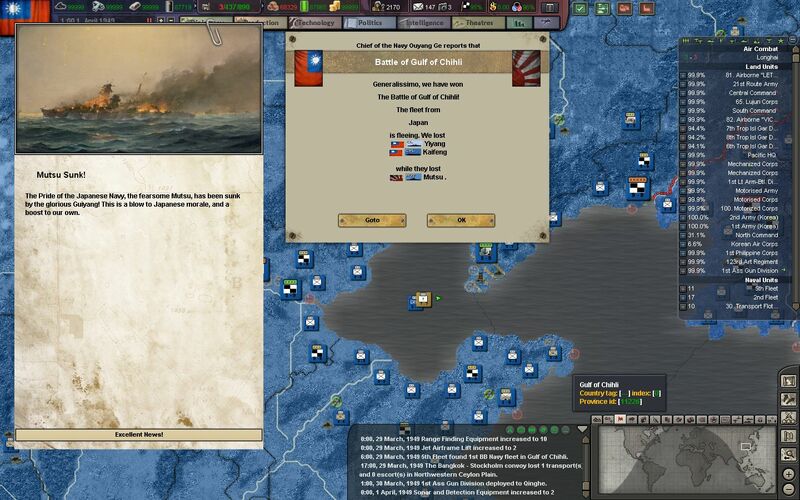 The admirals of the ROCN in particular lobbied for an invasion of Hokkaido to start. 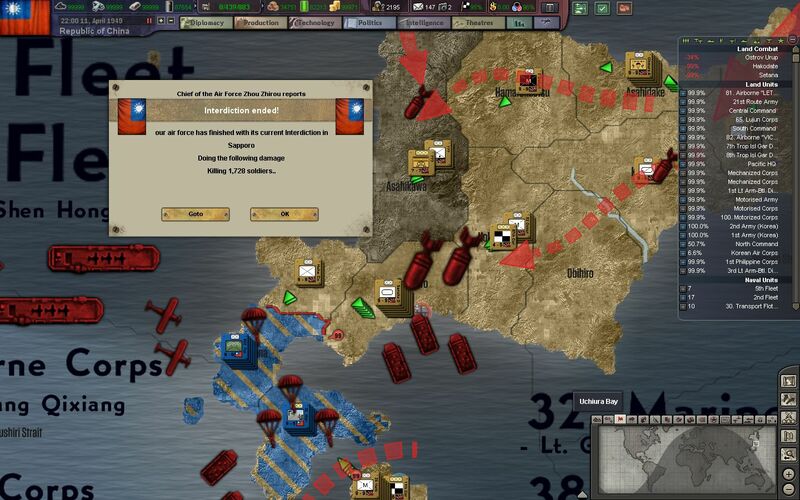 The plan will start off with light troops landing on the Kuril Islands north of Hokkaido, in order to draw troops away from the main landing areas. 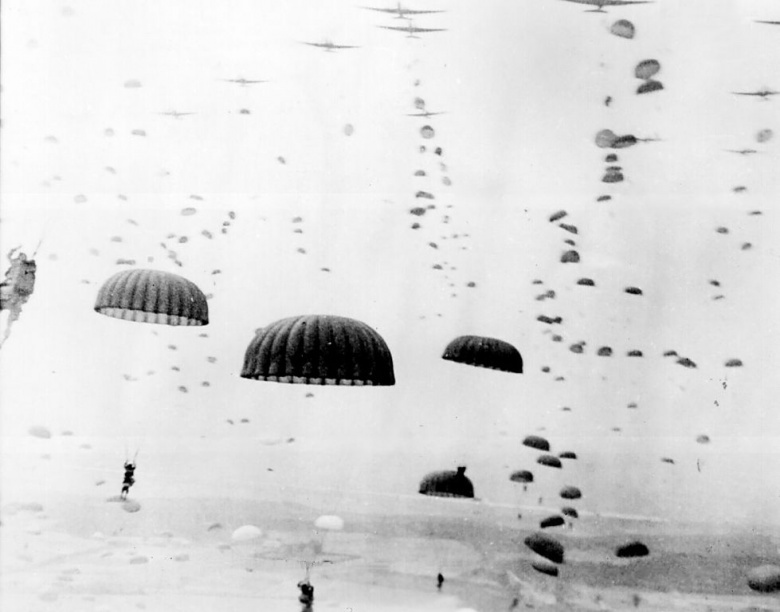 Paratroopers of the 82. 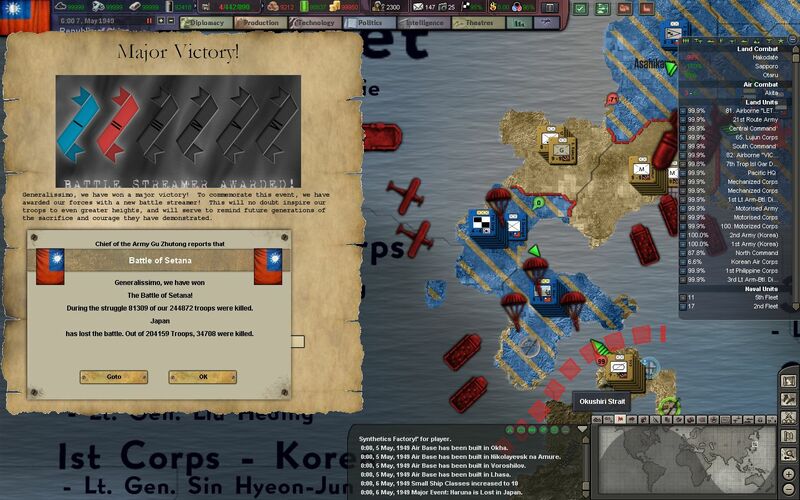 Airborne Corps will then seize Seitana and Hakodate, which will stop reinforcements from Honshu and trap the defenders at Hokkaido. Additional landings will then help to crush the remainder of the resistance, which we predict will mainly happen at the port of Sapporo. The Japanese know the invasion is coming, and desperately try to strike our staging areas in an attempt to slow the invasion down. 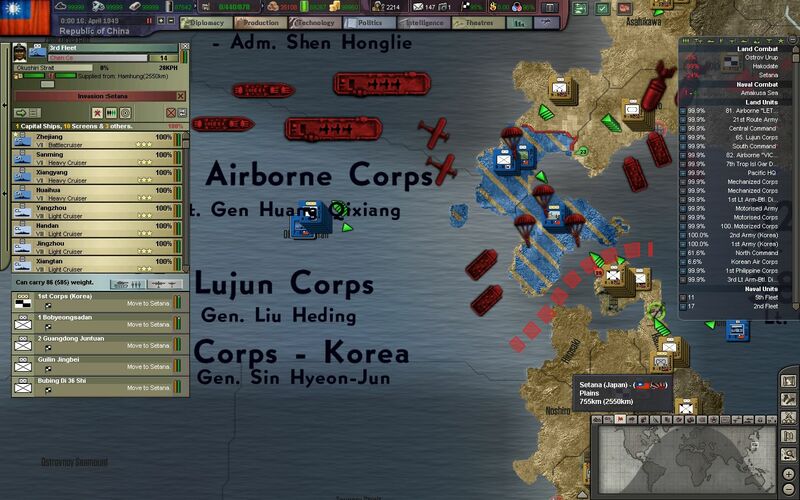 The newly formed Korean Air Corps, formed from Korean produced and manned aircraft, arrives to help stem the tide. 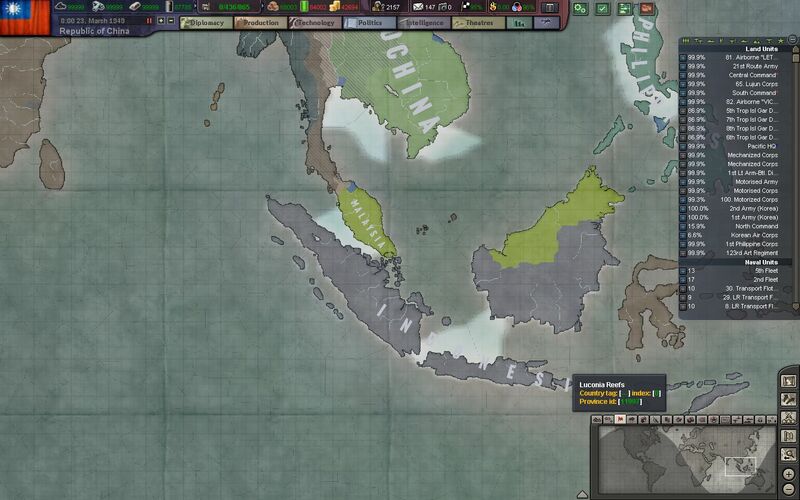 In the South, the divided Malay tribes have united and formed Malaysia, under the auspices of Chiang and the Kuomintang. For now, the NRA will maintain a heavily military presence on the peninsula and in the city of Singapore. 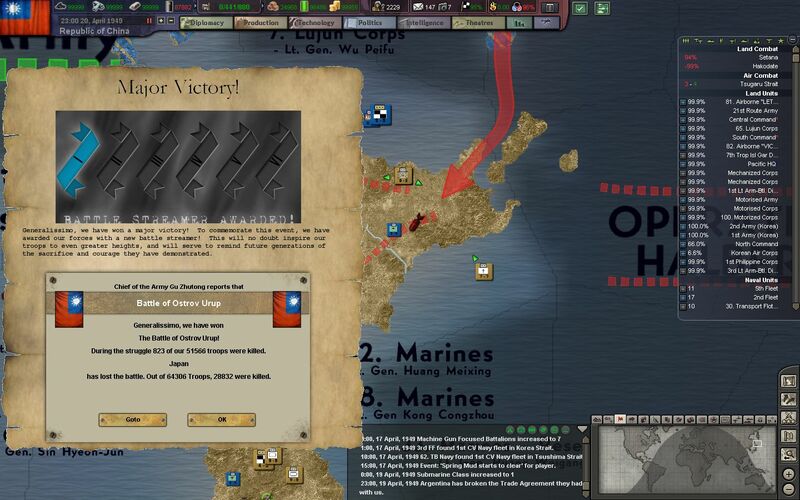 The first objective of Operation Halberd is both air and naval dominance around Hokkaido. Our interceptors clear the skies while our naval bombers make sure Japanese ships stay in port. 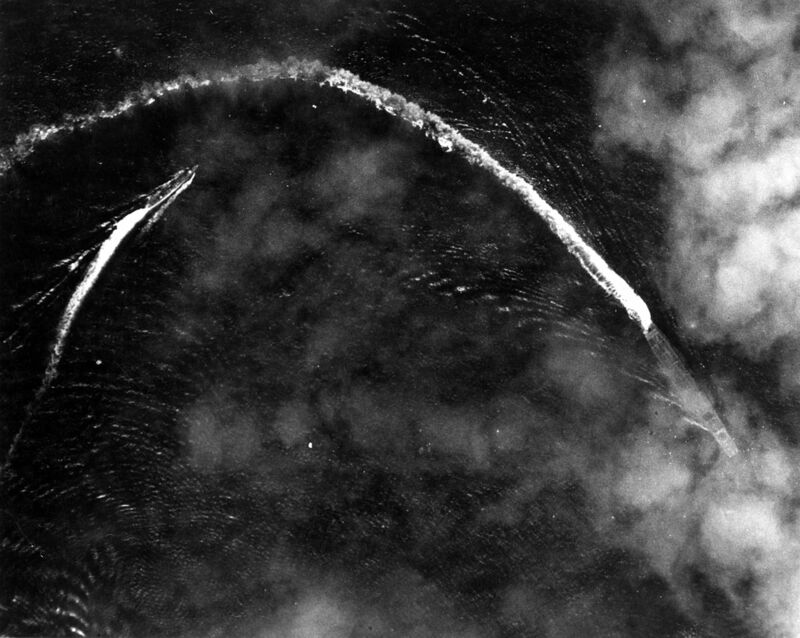 A stray carrier, the IJN Ryujo, is caught on maneuvers and promptly sunk by our bombers. 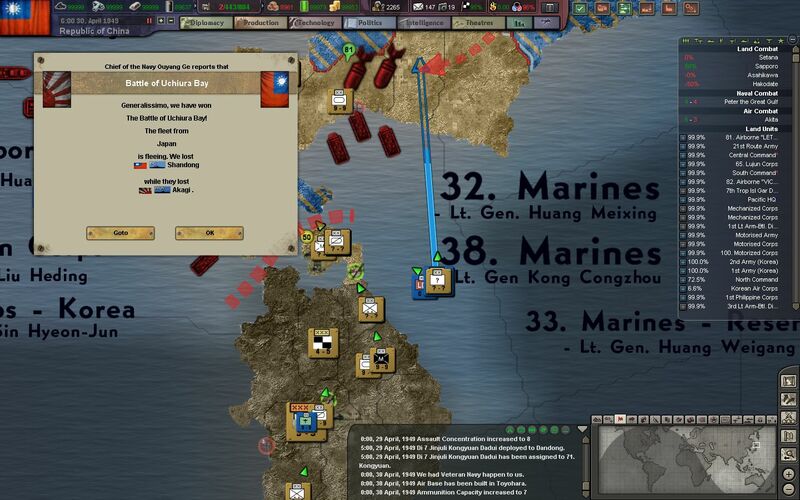 Another force of battleships is caught off of the coast of Qingdao, and the 5th Fleet is sent to intercept. 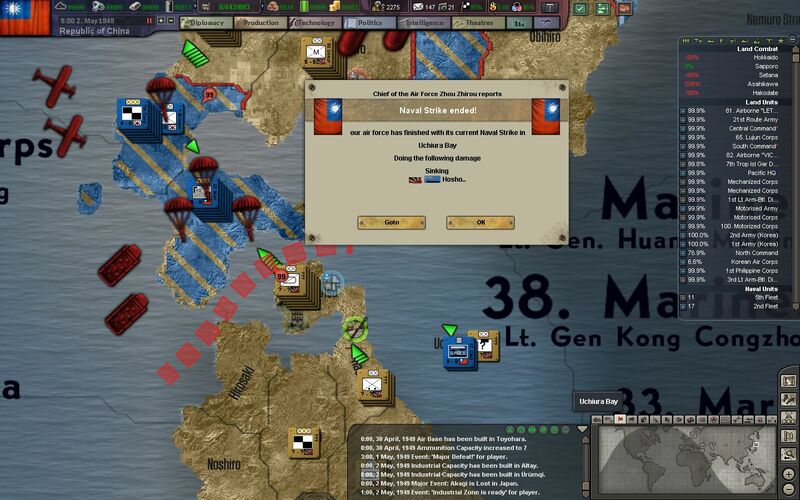 Although the 5th Fleet is mostly composed of outdated light carriers and light cruisers, we hope to keep the fleet pinned down until our land-based aircraft can arrive and turn the tide. Our torpedo bombers score multiple hits on the IJN Tosa, and the ship's magazine explodes in a massive fireball. The other two battleships, the IJN Mutsu and Iwami, retreat deeper into the Bohai Sea. Both ships have sustained heavy damage, but the 5th Fleet eventually falls out of position after a storm breaks up the fight. 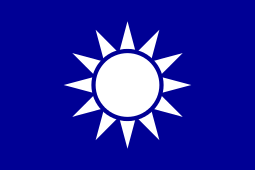 The two battleships are caught by the 5th Fleet again in the Bohai Sea at midnight, and a massive exchange of fire follows. For a few hours the ships attempt to follow muzzle flashes, but the constant lightning of the earlier storm continues to hamper our ability to track the ships down. Eventually, our cruisers are able to illuminate the battleship IJN Mutsu, and it is quickly sunk after a few salvos. 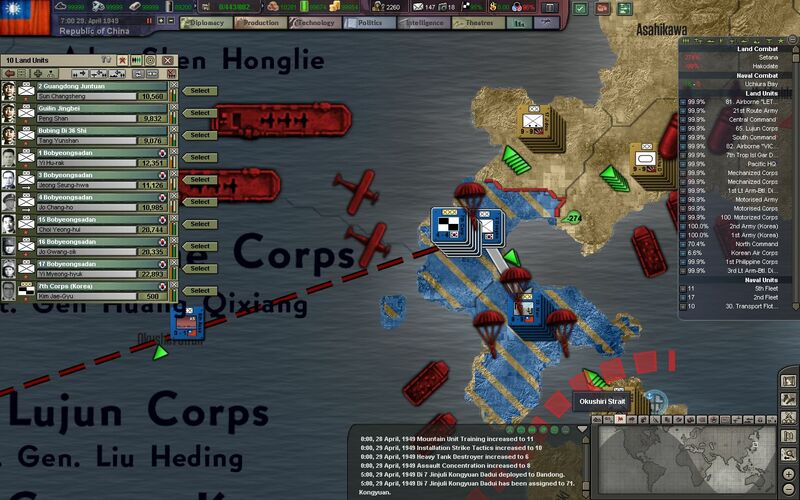 In the chaos of the night battle, the carrier ROCN Kaifeng is overtaken by a massive fire and is scuttled to prevent further damage and crew loss. 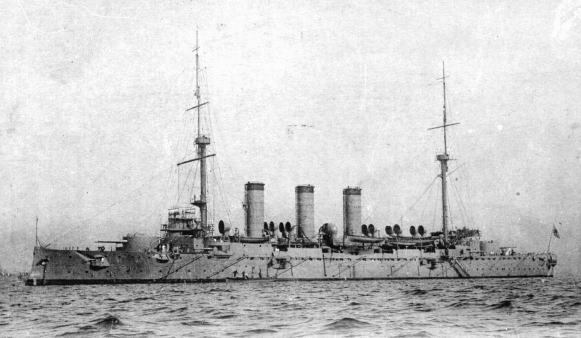 The light cruiser ROCN Yiyang is also lost after attempting to chase down the last remaining battleship, the IJN Iwami. The Iwami, one of the IJN's most modern battleships, is barely able to escape in the early morning hours. One of our MTBs report that the ship is listing heavily, but still moving at high speeds. 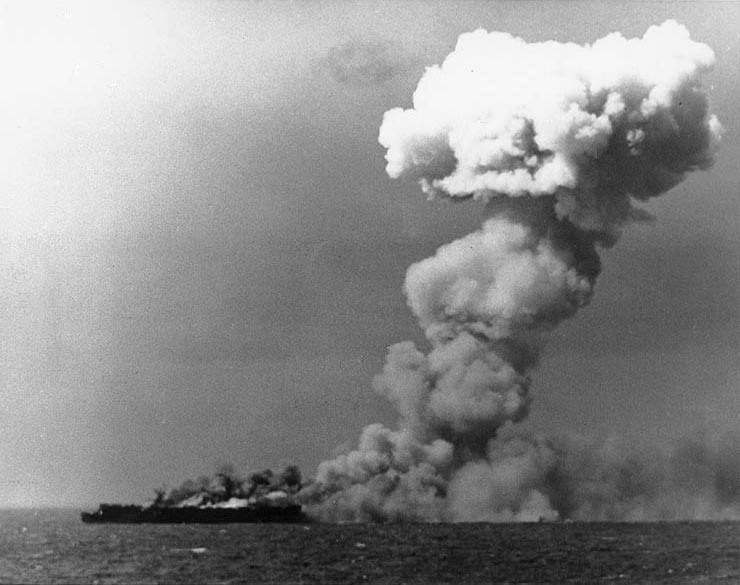 The 5th Fleet is too badly damaged to continue its hunt, and is sent back to port for repairs. Japan is quickly running out of fuel to run its air force and navy. All of its prewar oil came from trade, and more recently from its conquests in Indochina and around the Pacific. 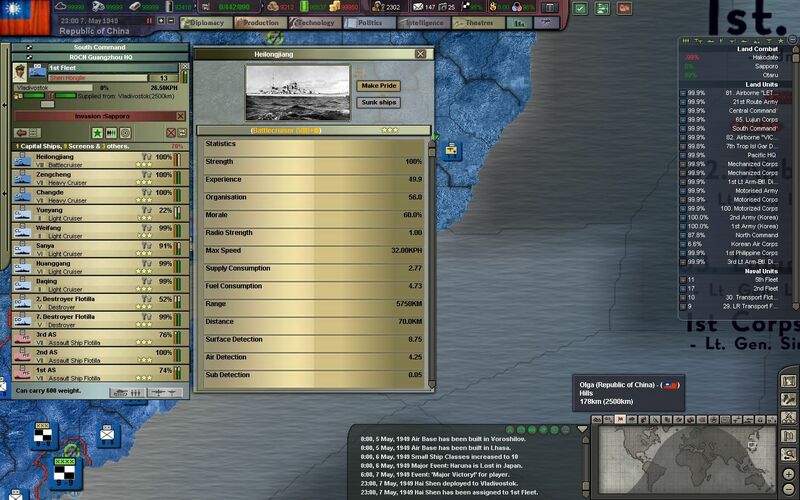 Now that its colonial holdings, convoys, and trade partners are all gone or out of reach, the IJN cannot afford many more sorties like this. Operation Halberd kicks off with the 7. 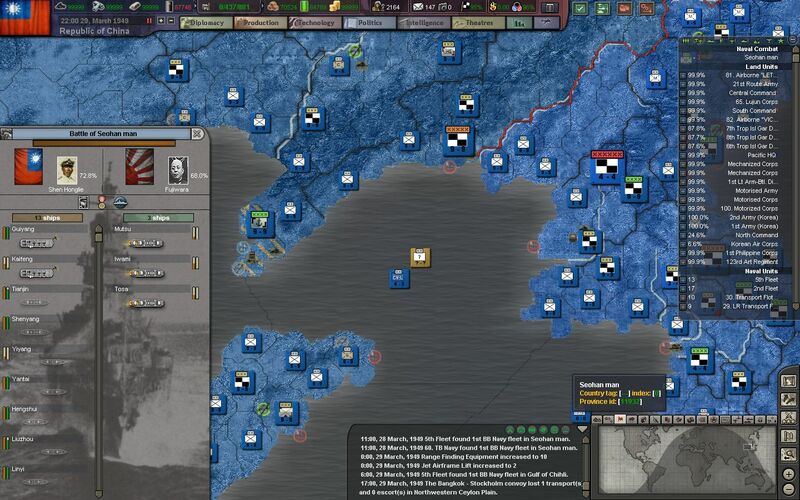 Light Division landing unopposed on the Kuril Islands, hoping to lure the defenders of Hokkaido into an attritious island-hopping battle in the North. Our recon planes indicate that our plan is working. Many men on the island are already on the move. 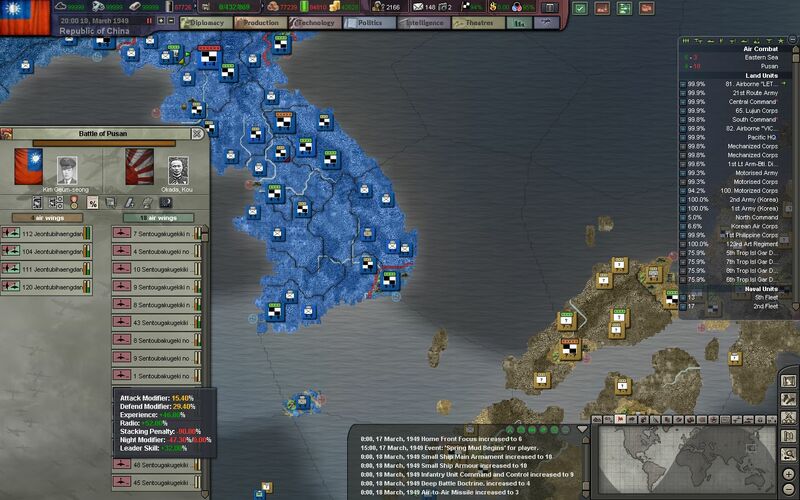 The Japanese commanders are too zealous to realize the meaning of the landings. Soon after the 802. 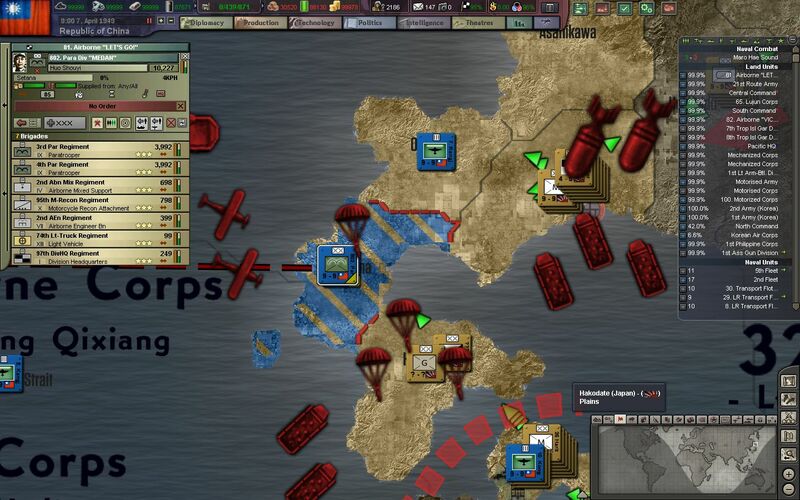 Airborne Division drops on Seitama and quickly secures land crossings into Sapporo from the South. Over 20,000 men are dropped in just under 6 hours by our air transport fleet, just before dusk. They quickly overwhelm the local police and town garrisons, and dig in to prepare for enemy assaults. 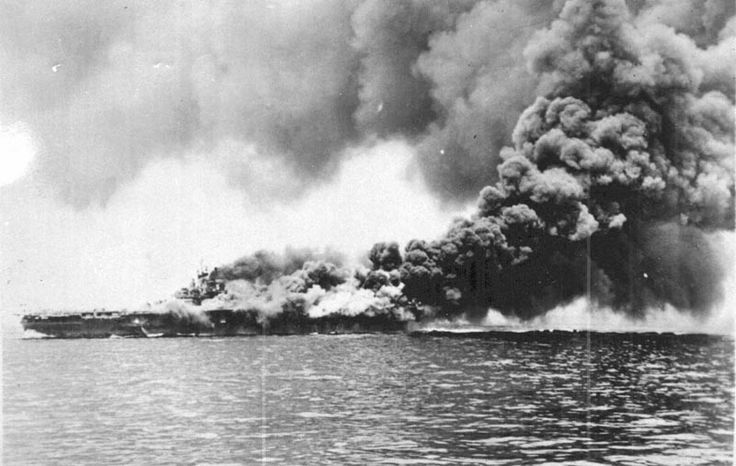 The 1st Fleet, carrying marines and landing craft for the landing on Hakodate, comes under a reckless attack by the sole coastal battleship Yakumo. The lightly armed IJN Yakumo sends out a few volleys near the landing zone but fails to make any hits. It is then forced back into port shortly after. The small garrison on the Southern tip of Hokkaido, at Hakodate, is shattered by our hardened marines. 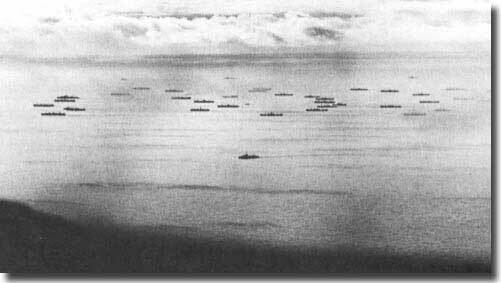 As the 1st Fleet pulls out of Uchiura Bay, it is caught by the IJN battleships Suwo and Haruna. 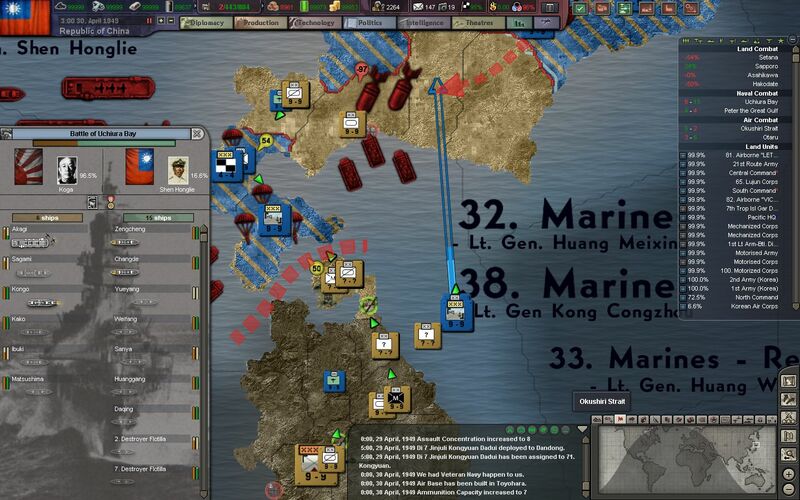 The 1st Fleet retreats with the sole loss of the heavy cruiser ROCN Ningbo. 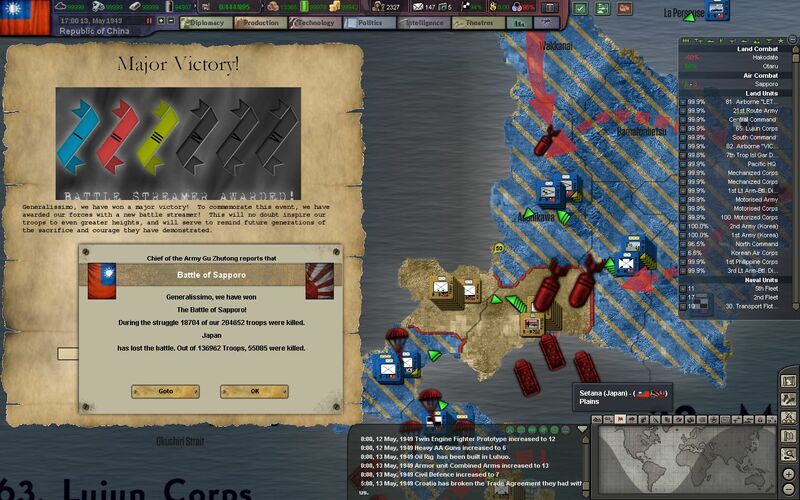 Although now our troops are without coastal fire support, their main mission has been completed, and all units have landed relatively safely. 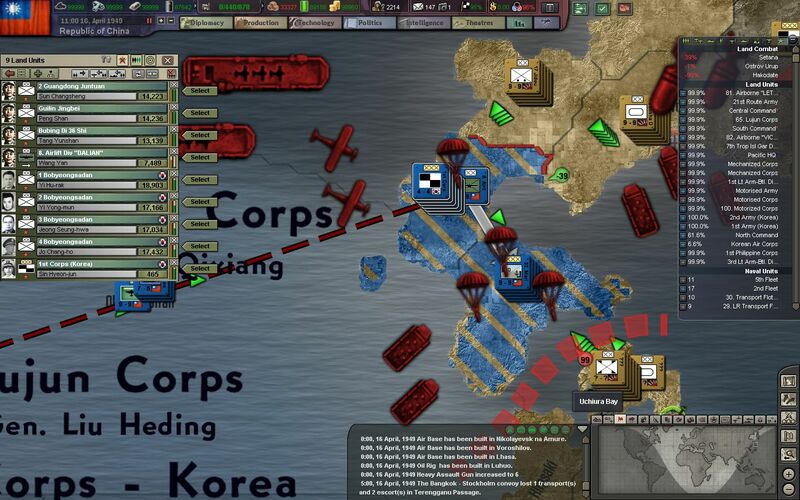 Our paratroopers at Setana, holding out bravely for nearly 4 days already, receive badly needed reinforcements after 3 Korean divisions are landed overnight by an auxiliary transport fleet. In an attempt to relieve some of the pressure on our paratroopers, our close air support runs more frequent and more dangerous sorties. 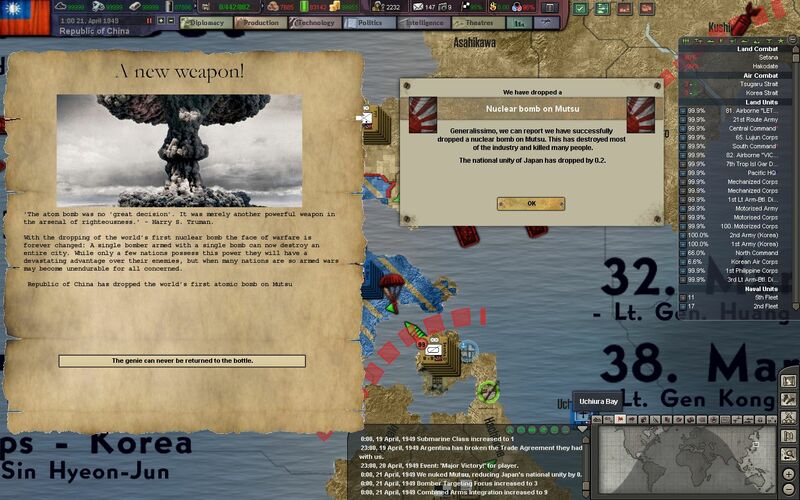 One such attack on Sapporo is extremely successful. Our CAS runs are the saving grace for many of our airborne squads, who are forced to hold crossroads with nothing more than the rifles, mortars, and infantry guns they were dropped with. 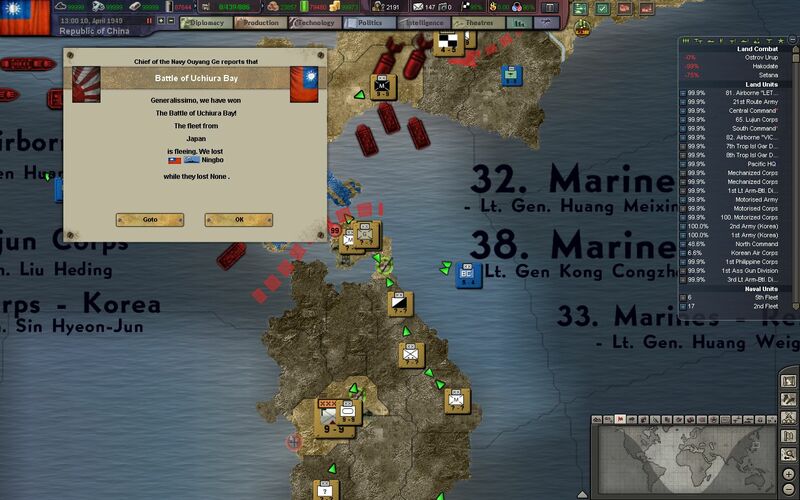 The 3rd Fleet makes another transport run to Setana, this time ferrying over another 50,000 men of the 30th Army and 1st Korean Corps. Our paratroopers are given some much needed rest, as they are sent to the reserves at Hakodate. 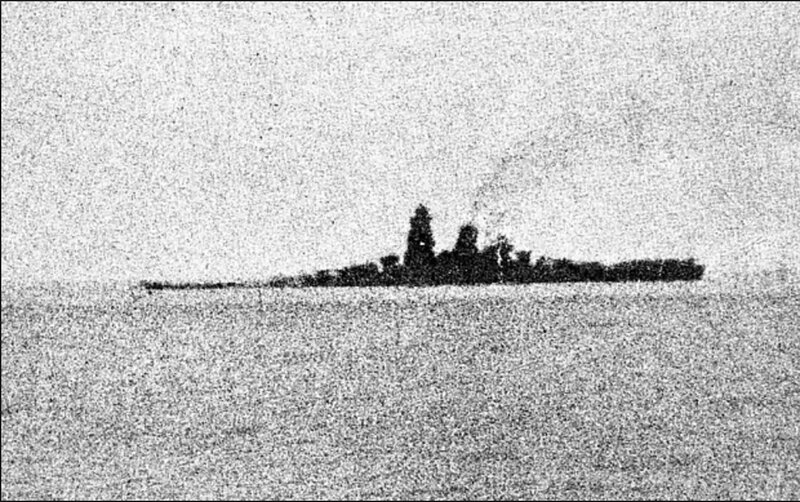 Another fleet carrier, the IJN Katsuragi, is sent to the bottom of Uichiura Bay by our naval bombers. The loss of one of their more modern carriers, the IJN Katsuragi, is the symptom of the growing deficit of fuel and aircraft in Japan. 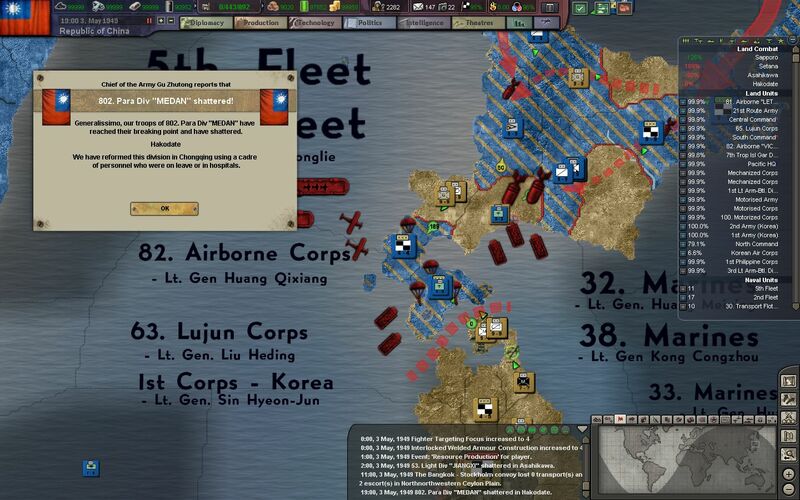 The IJN is thinning out by the week, and soon we will be able to sail the seas uncontested. 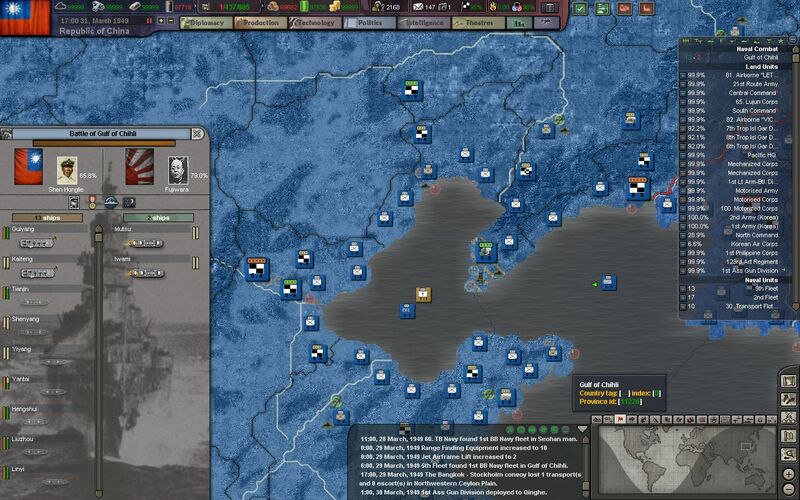 The militia and regular units operating around the base of the Kuril Islands are bombed into oblivion by our CAS support, and our light troops on Ostrov Urup are free to march into northern Hokkaido. 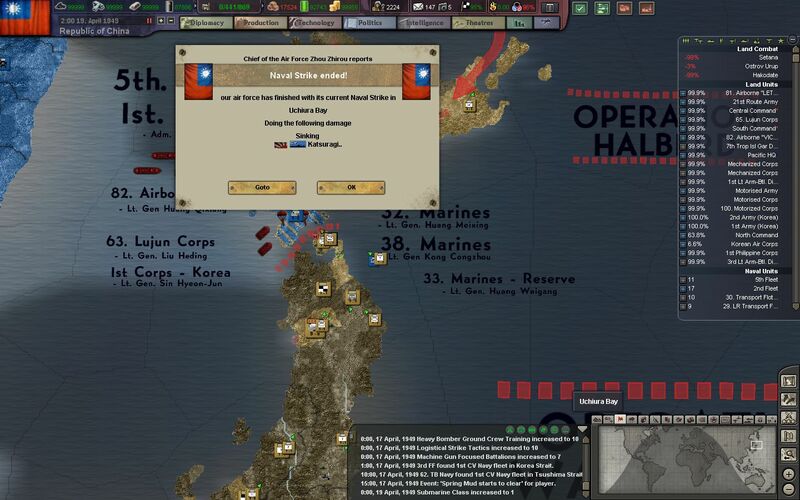 Even with our recent successes - the resistance on Hokkaido is not letting up. 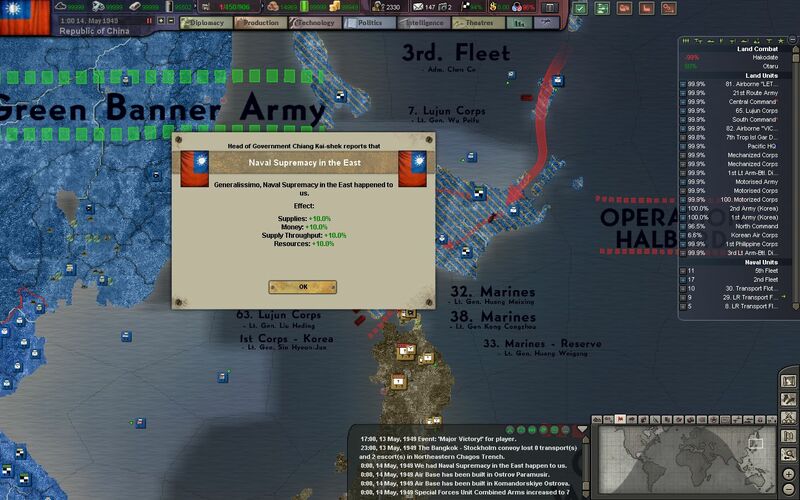 Over 400,000 regulars and militia are ready for a fight to the death, and every day more "volunteer fighters" are called upon to defend the Home Islands. Armed with nothing more than 19th century Murata rifles, or just anti-tank grenades, men, women, and children stand ready to oppose our marines and paratroopers. 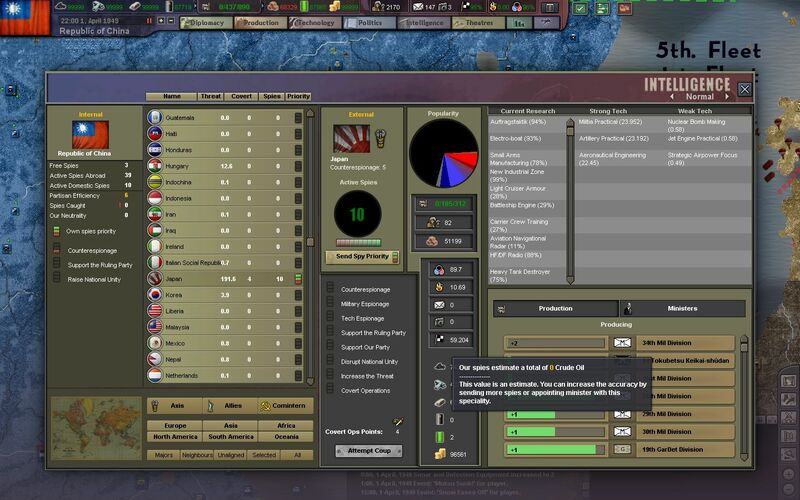 Another compounding factor is our lack of supplies, without a port, and the continuing flow of men from the Honshu port of Mutsu, south of Hokkaido, into Sapporo and the defending armies in Hokkaido. In order to win the battle in Hokkaido, this flow of supplies from Honshu must end. 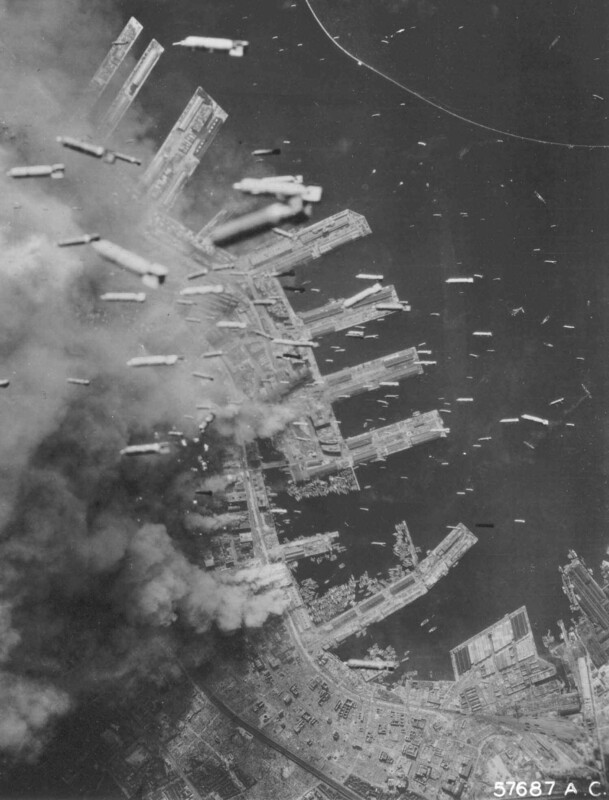 A few hours later, the first atomic bomb is dropped on the port of Mutsu, obliterating its facilities, dockyards, and scores of supply and auxiliary ships. 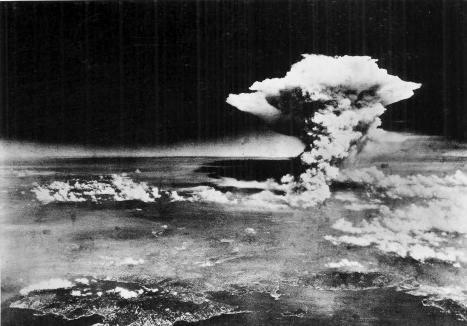 20 kilotons of TNT shake the earth for miles around, and the mushroom cloud rises kilometers into the air. The blast is heard and felt by our men all the way across the Tsugaru strait, in Hakodate. 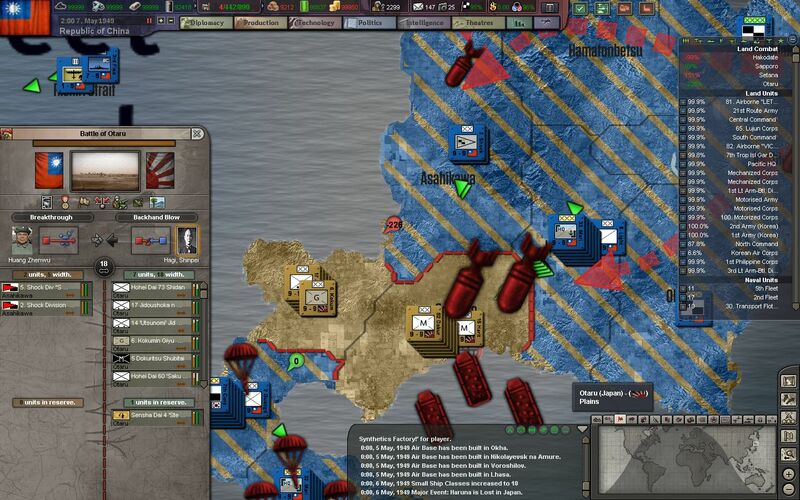 Japanese shipping and logistical capability in and around Mutsu is destroyed, and now convoys to Sapporo must brave our gauntlet of convoy raiders and aircraft before reaching Hokkaido. Our troops in the North now fight with extra vigor. 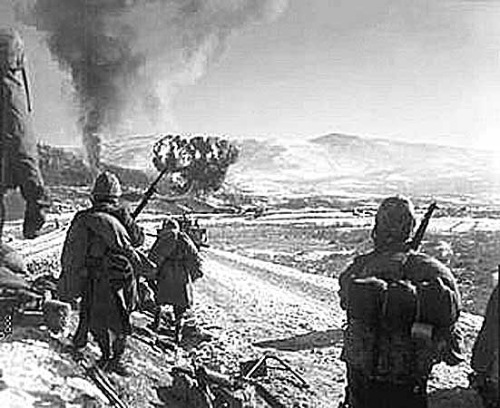 Light troops landed in the north at Wakkanai break through the Japanese trench lines and advance south towards the crucial port of Sapporo. 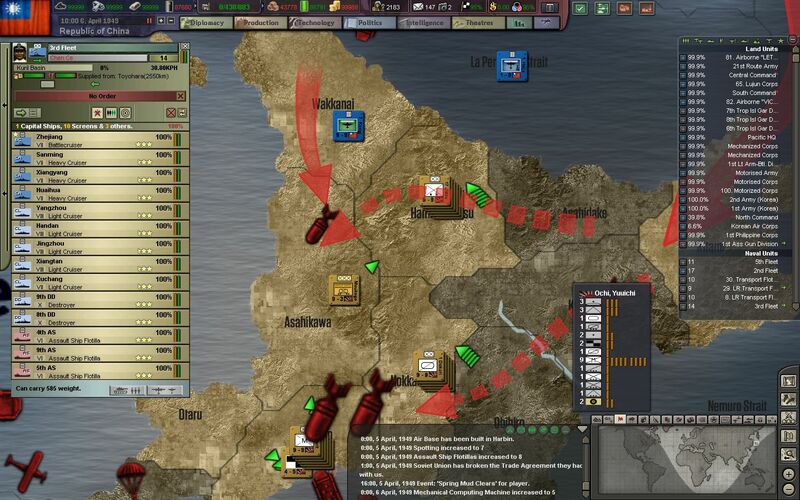 Many of these soldiers only have the supplies and ammunition that they landed with, and high command estimates that our forces can only fight for another few weeks before they run out of supplies. The port of Sapporo must be captured as soon as possible if we are to hold onto our foothold in Hokkaido. 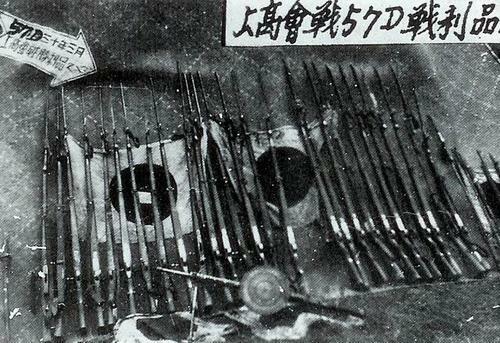 Captured Japanese weapons are more and more common among our troops - some of which have exhausted ammo for their weapons in just under a few days. Although the Japanese have been more than proficient in destroying their supply caches, our troops manage to scrounge around and find what they need as they advance. The 1. and 7. 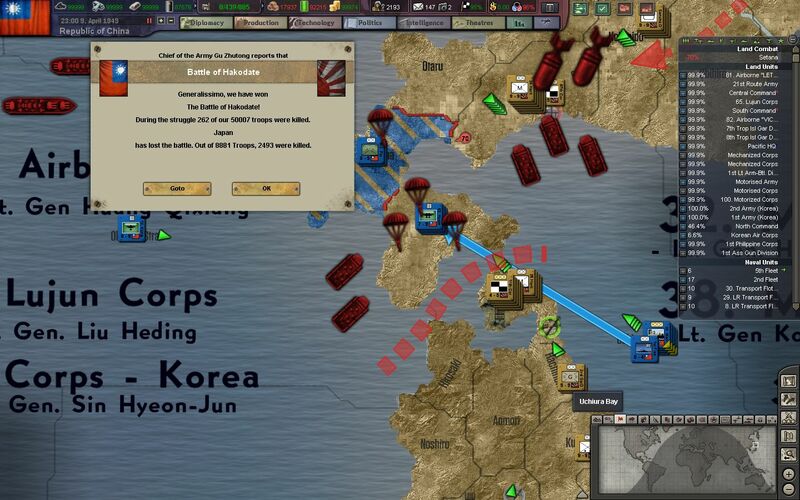 Korean Corps defending Setana and the head of the Kemada peninsula are under increasing pressure from the Japanese. New and fresh troops can always be landed, but it is clear this position is untenable. 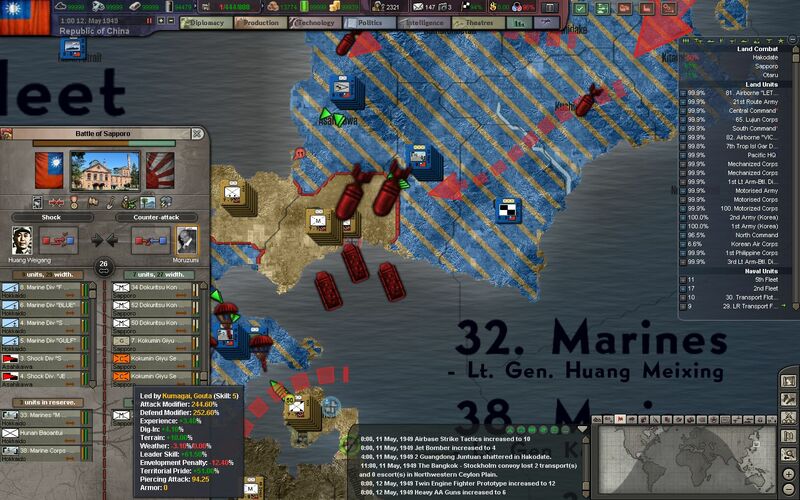 As the 1st Fleet lands more marines to the east of Sapporo, it comes under attack from the carrier IJN Akagi, battleship IJN Sagami, and a complement of cruisers. After a brief exchange of fire, the battlecruiser ROCN Shandong is lost, while our bombers manage to sink the antiquated carrier IJN Akagi. 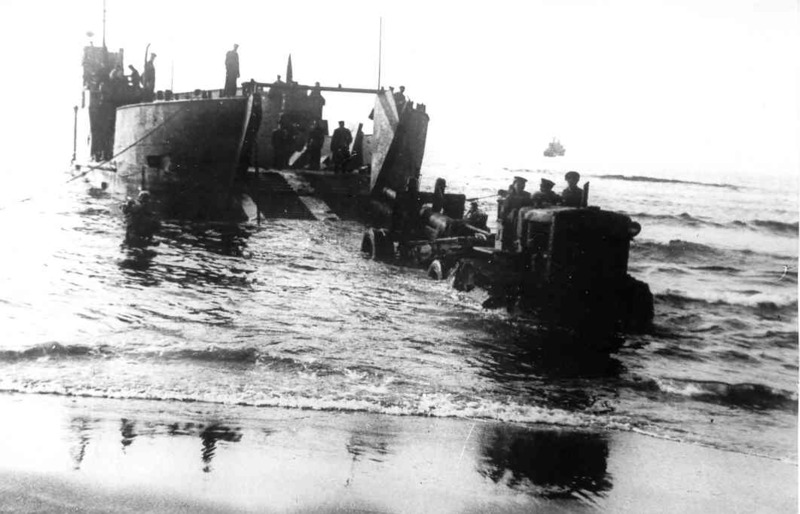 The IJN turns back and returns to port, where they belong. 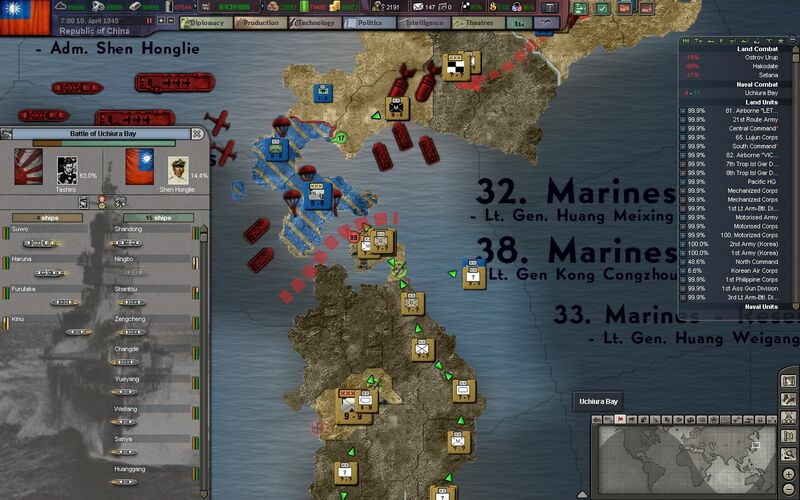 Along with our marines on the outskirts of Sapporo, are the famed Shock Divisions - who were able to decisively swing the deadlocked battle of Kuala Lumpur during our Pacific Campaign. 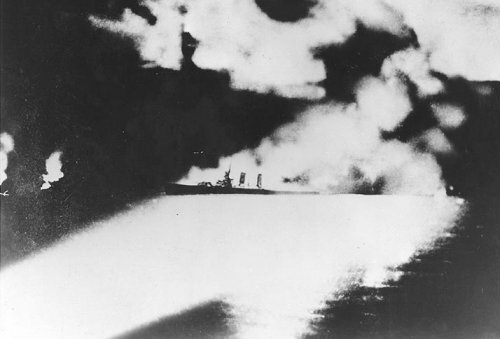 More IJN bravery is rewarded with death and sunken ships. We rule the seas! 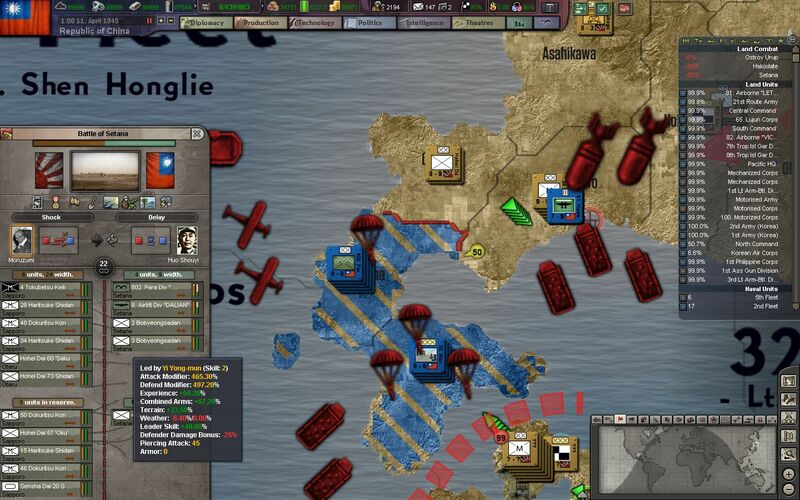 The troops on the Oshima peninsula are wearing thin, and supplies are being eaten through fast. A hastily built airbase at Hakodate will allow our transport air fleets to fly in supplies, but this will not be enough for the long term. The 3. and 4. Shock Divisions, along with a strong compliment of battle-hardened marines, lead the assault on Sapporo. Opposing them are hundreds of thousands of hastily called-up militia, as well as several divisions of regular troops. The 3. and 4. 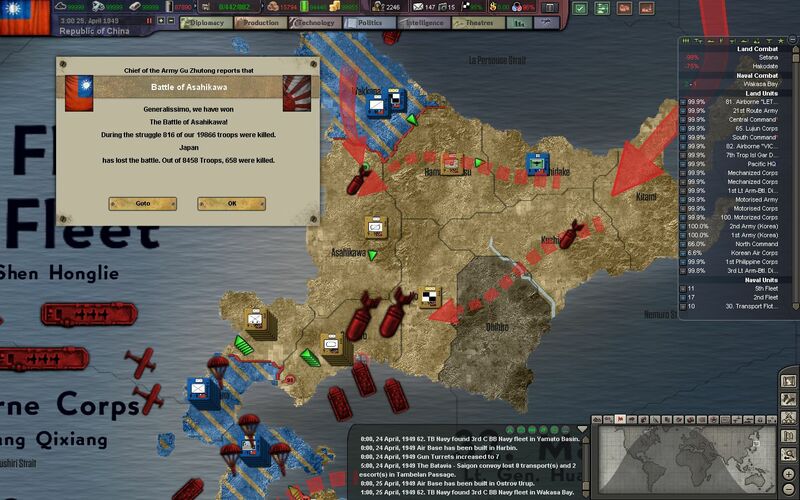 Shock Divisions employ deadly combined arms warfare on all levels. Elite shock troopers are flanked by armor, assault guns, and are supported by heavy 155mm howitzers. They have the firepower to level entire city blocks, and the bravery to rush through withering machine gun and mortar fire. 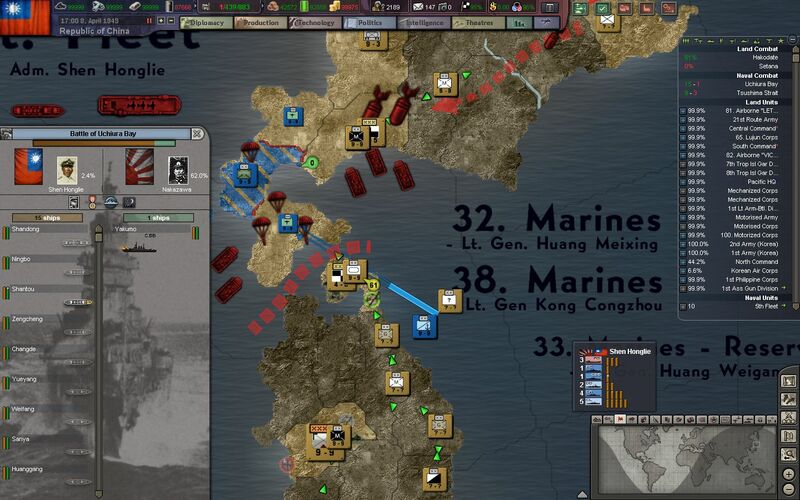 More veteran, guards divisions are sent in to assist the Koreans holding the Oshima peninsula. This should buy us some time while our shock divisions work to take Sapporo. The 2. and 5. 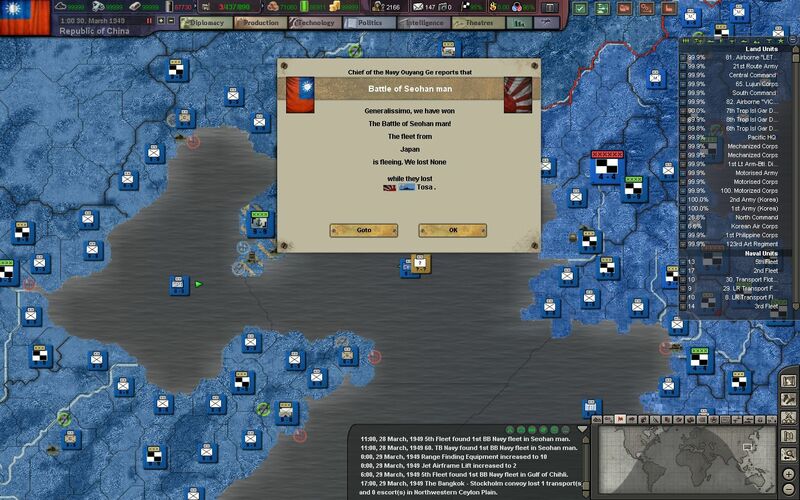 Shock divisions are landed shortly after, to apply pressure on the last holdout of Otaru, outside of the city of Sapporo. ...and our guard divisions waste no time in mounting a massive counter-attack of their own. 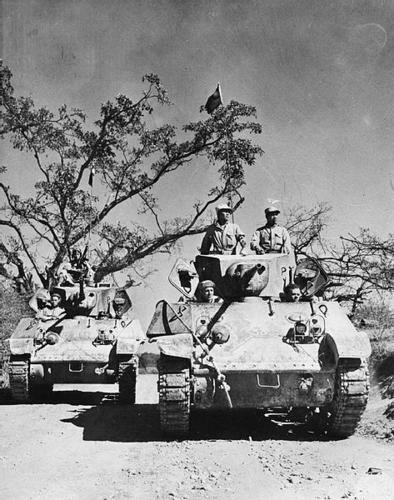 The Korean defenders of Setana are given some much needed rest, while our guards push on. 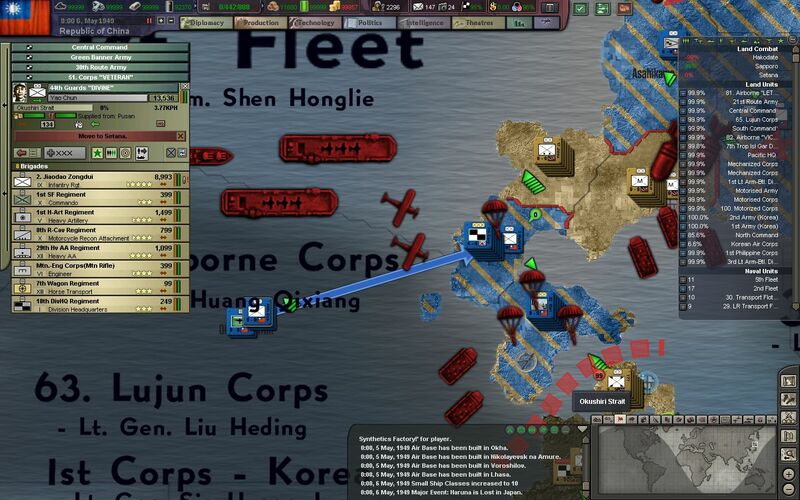 The loss of the ROCN Shandong is soon offset by the commission of the new ROCN Heilongjiang, our navy's most modern battlecruiser, capable of going head to head with any IJN battleship. 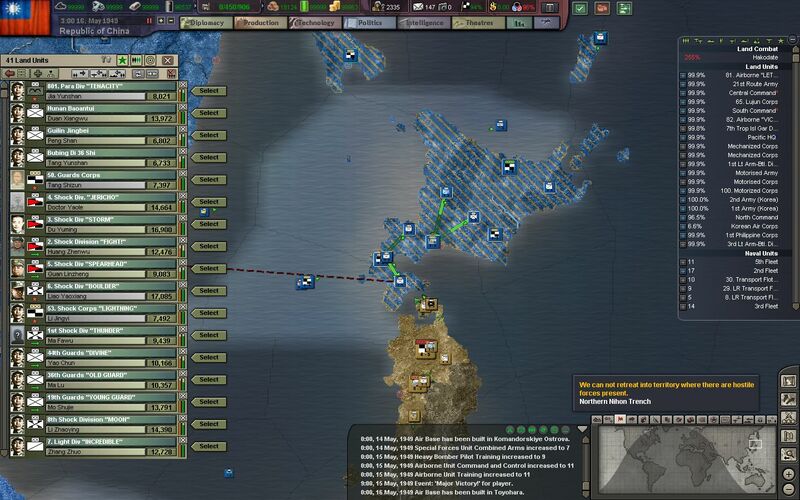 The forces holding Hakodate and the Tsugaru strait are breaking, one by one, as they run out of supplies and men. The port of Sapporo must be captured soon. The city's defenders are reduced to around 80,000 militia and conscript units, who try in vain to hold back our unstoppable tide of armor and shock troopers. In just over a week since the beginning of the attack, Sapporo is cleared out and the 3. and 4. Shock Divisions secure the city streets. Nearly 50,000 of the city's defenders are killed, and the same amount have thrown down their weapons in surrender. The rest of the forces retreat back to their stronghold at Otaru, where the last defenders of Hokkaido are making their stand. 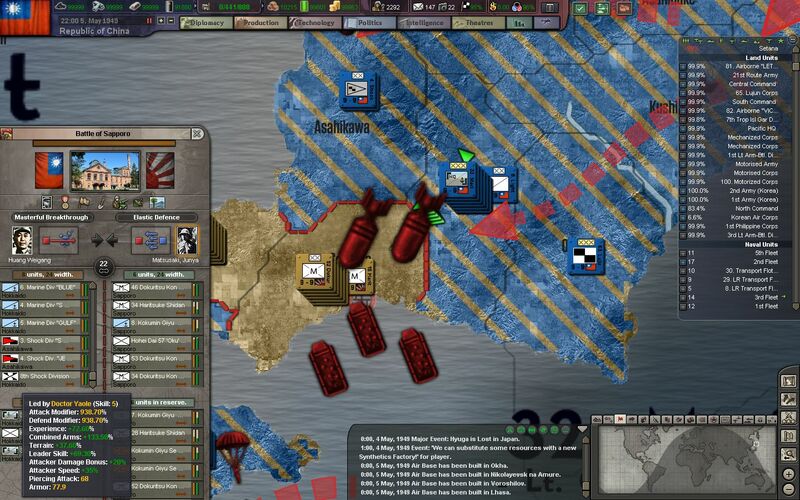 The port of Sapporo is badly damaged from fighting, and additionally is sabotaged by the retreating Japanese forces, but much of it is easily repairable. Supplies begin flowing in from some of the more intact docks. 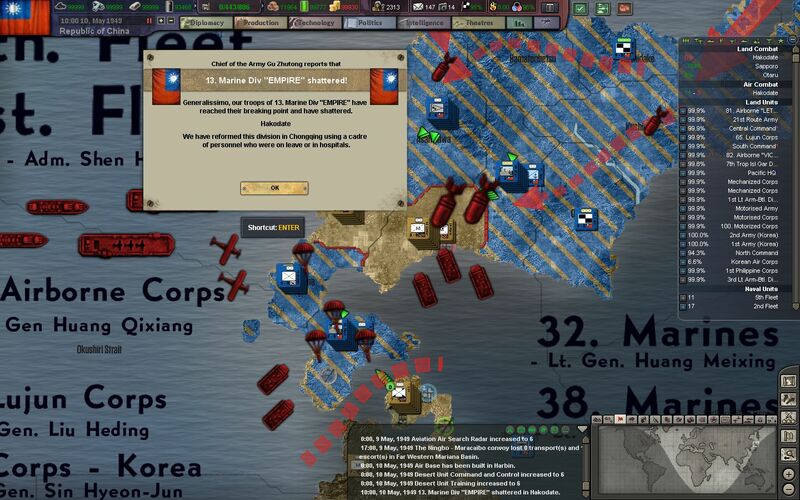 Our Supremacy of the Pacific is now unquestionable. 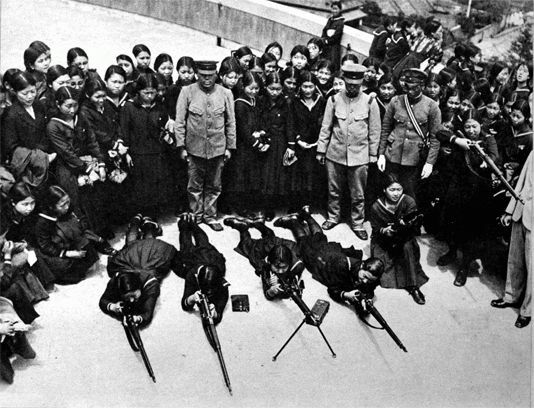 The last stragglers at Otaru are mopped up by our marines and guard divisions, but at great cost. Combat in the sparsely populated island of Hokkaido is already taking its toll on our men. 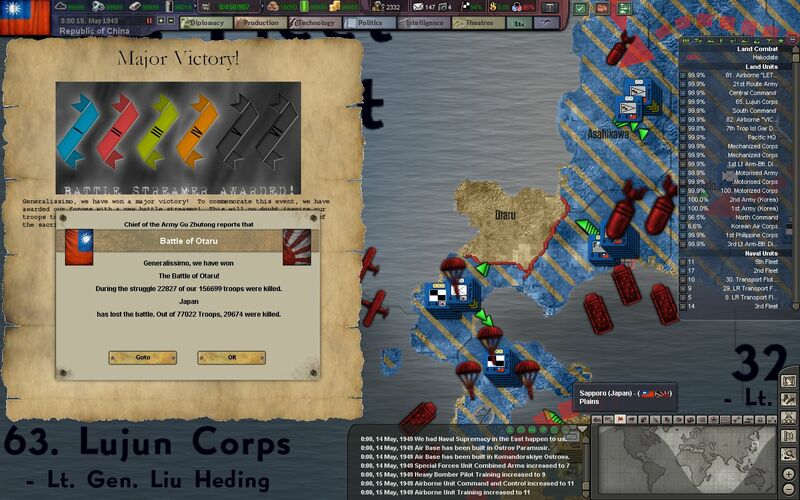 Operation Halberd is declared a success once Sapporo and Otaru are secured. 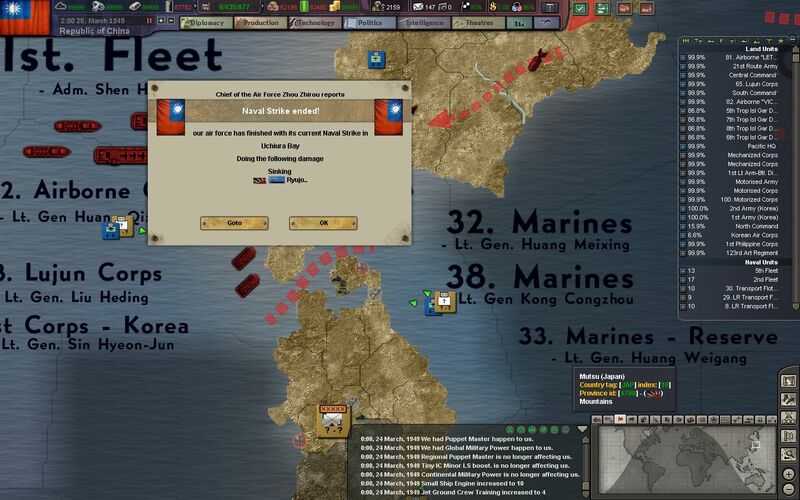 Nearly 500,000 men of the NRA, ROCAF, Marines, and ROCN have taken part in this victory. 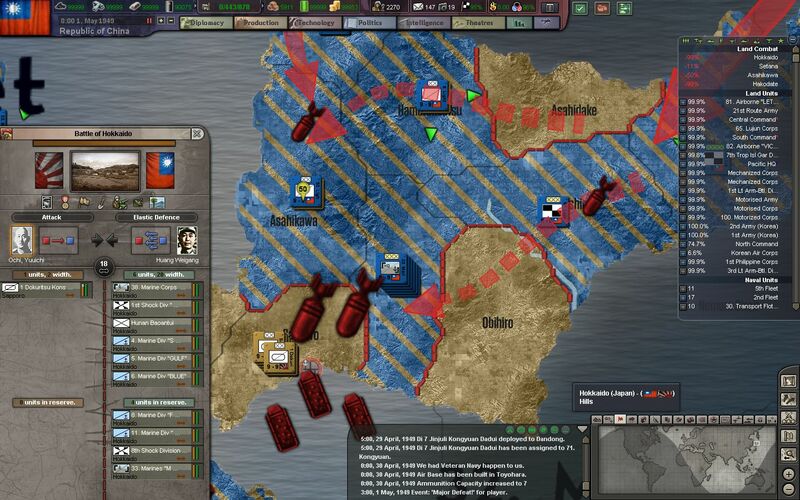 However, this coordination pales in comparison to what is needed for the next step in Operation Warhammer - the invasion of the main island of Honshu. Thanks for reading! I try to post episodes on Mondays, so if you don't see one, then it's probably coming the next week instead. As always, feedback is very, very much appreciated in the discussion thread.